If New Zealand isn’t on your travel bucket list yet, that’s about to change. From its sandy shores to its snowy peaks, this country is unspeakably gorgeous. Add to that their rich history, penchant for adventure, and indulgent gastronomical offerings—and you’ve got more than enough for a great vacation. Here are our top picks for what to check out in the big cities, as well as off the beaten path. The capital city of Wellington isn’t as popular a tourist destination as New Zealand’s other larger cities. But whatever it lacks in size, it makes up for in charm. Visitors will find the Wellington Harbour to be a lovely place to relax or indulge. Grab a bite at one of the seaside cafes, or book a cruise to explore the bay’s other islands. If you’re looking to unplug during your New Zealand holiday, head over to Lake Taupo, where you’ll be enjoying the outdoors too much to check your emails. Despite it being relatively remote, the area has lots of activities for travelers. Whether you’re into more physical adventures like paddleboarding, or more leisurely ones, like lounging in hot springs, Lake Taupo is an excellent place to commune with nature. Auckland is New Zealand’s largest city, and one of its most popular tourist destinations. So if you find yourself with a few free hours here, stop by the city’s Art Gallery. Not your average stuffy museum, the contemporary, interactive collections will stimulate your creativity. This stunning destination is a paradise for the senses. The 10 acres of lavender fields are visually-striking, aromatic, plus, the farm offers visitors the opportunity to taste lavender-flavored ice cream, tea, and honey. You can also shop for essential oils, soap, and balms. Located in Auckland, these indoor gardens are a can’t-miss daytime activity. With its ornate glass ceilings, and courtyard full of neoclassical statues, the Wintergardens offer tourists a little taste of Europe. Nearby, there is the Wintergarden Pavilion where you can reserve a table for high tea. Bring your camera! When exploring a new country, it’s best to get the local perspective. And who’s more local than the indigenous Maori people? Book a tour of the Tamaki Maori Village in Rotorua to get a glimpse of New Zealand’s history, and to participate in their native customs. This outdoor garden is sprawling, with an exceptional view of the bay. Additionally, there are always great events, like outdoor concerts, on its calendar. So whether you want to take a bike ride through the tree-canopied paths, or take the cable car instead, the Wellington Botanic Garden can accommodate any kind of traveler. One of the most exciting adventures New Zealand has to offer is jumping out of a plane at a heart-stopping 16,500 feet. Freefall at 200 kmh, and as the parachute opens, gently descend into Auckland while taking in the gorgeous vistas. This is an extremely popular activity though, so book in advance! For a trek like no other, visit Fox Glacier and its namesake town in the South Island. Hike or book a helicopter to explore the icy phenomenon and its clear blue meltwater. If you’re feeling especially adventurous, you can climb it with ice picks! Nearby are the famous Glowworm Caves—which are a lot more astonishing than their name suggests. If you’re into quirky tourist attractions, check out the Cardrona Bra Fence. In the late nineties, passers-by started hanging bras on this fence along a public stretch of highway in the Cardrona Valley. No one really knows why the undergarments began appearing when they did, but one thing’s for sure: this is one of the most popular sites in the area. One of New Zealand’s best rated restaurants, Twenty Seven Steps is located on a quaint, colorful strip in Christchurch. Be sure to order their frozen rosé and, if you’re visiting in the warmer months, try to get a seat outside in order to experience the vibrant locale in all its glory. For a full day of fun, ride the luge (a gravity-powered go-kart) down the winding paths of Skyline Queenstown during the day, and stargaze at night. There’s also paragliding, cultural activities, and a restaurant with a panoramic view of the area. 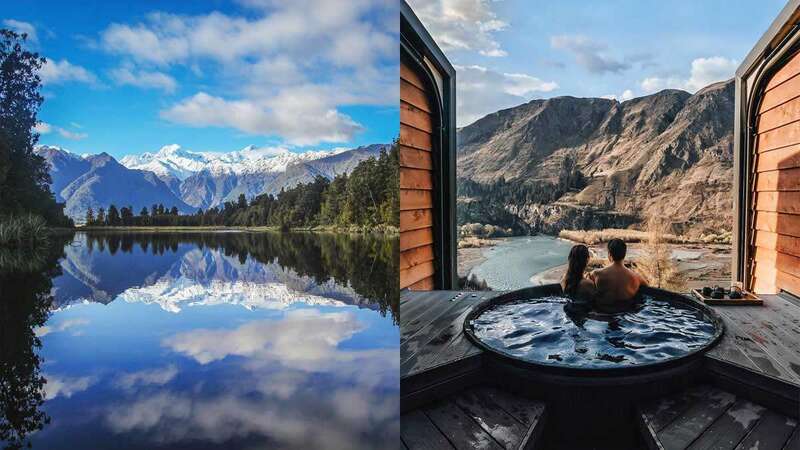 If you need to take a break from all the adventuring, the Onsen Hot Pools in Queenstown are the perfect place to unwind. This day spa boasts cedar-lined pools overlooking a river, top of the line massage facilities, and complimentary transport to and from the city—so you don’t have to worry about anything. Another relaxing getaway is Koru Hideaway, a romantic accommodation just an hour’s drive from Auckland. Here you can luxuriate in an open-air bathtub, snuggle up in front of an outdoor fireplace, or watch the sunset from a private deck. For a different kind of adventure, check out the urban nightlife. While those who are used to Manila’s lively afterhours may find Auckland’s to be a bit subdued, places like The Classic are a great way to meet locals, learn more about the culture, drink a bit, and laugh a lot. Jack Tar is a hip, casual restaurant that serves delicious classics like burgers and pizza. But what makes this waterfront eatery stand out is the view of Auckland’s North Wharf from its alfresco courtyard. You can enjoy a meal here for breakfast, lunch, or dinner. If you find yourself in the off-the-beaten-path destination of Hawke’s Bay, make your way to Birdwoods Kitchen for a hearty, delightfully-Instagrammable meal. This area is home to luxe vineyards. But if you’re into tasty confections, warm folks, and a homey ambiance, skip the wineries and grab a treat here instead. Whether you’re a fan of the Lord of the Rings trilogy or not, the draw of Hobbiton is undeniable. This skillfully crafted set is not just a cinematic novelty embedded into the landscape—it’s art! The fun of interacting with this mythical world will fit right in with all the other magical experiences this country has to offer.